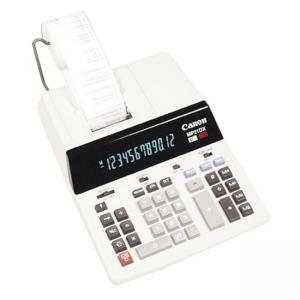 This two-color printing/display desktop calculator features an easy-to-read 12-digit fluorescent display. Quiet, two-color ink ribbon printer generates 3.5 lines per second with positive numbers in black and negative numbers in red. Decimal positions are add mode, 0, 2, 3, 4, 6 and floating. Functions include four-key memory, grand total, mark-up/down, tax calculation tip, sign change, item count, and delta percent calculation. Design includes a spacious keyboard with large key tops and heavy-duty metallic paper holder. Calculator uses a 2-1/4" (57mm) wide plain paper roll. Calculator runs on AC power and weighs 4 lb. Dimensions: 2.63" x 9.12" x 11.33"